Tiffanie King is a wealth advisor with William Blair’s Atlanta Wealth Management team. She specializes in providing comprehensive wealth planning and tailored investment advice to corporate executives, high-net-worth individuals, business owners, and their families. Tiffanie joined William Blair in 2014 and previously managed the firm’s Corporate and Executive Services platform. 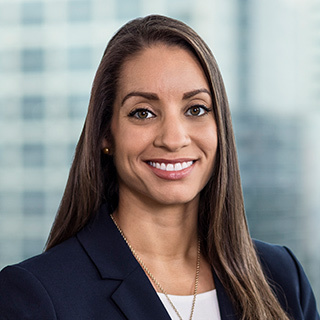 In that role, she served as the liaison among the firm’s investment banking, equity research, institutional trading, and asset management departments and guided clients through the maze of regulatory and financial considerations facing corporate executives. Tiffanie joined William Blair after more than 10 years with Morgan Stanley and its predecessor firms. There, she assumed increasingly advanced roles in the areas of portfolio management and investment strategy for both individual and institutional clients before earning her CFP® and focusing on comprehensive financial planning. Tiffanie graduated from The Ohio State University with a B.S.B.A. in finance. She holds the CERTIFIED FINANCIAL PLANNER™ designation and is a member of the Financial Planning Association. An Ohio native, Tiffanie moved to Atlanta in early 2019 and enjoys playing tennis, running, and traveling.